Severe arthritis within the foot and toes may cause pain that makes it difficult to walk and wear shoes. While conservative treatments such as shoe modifications, injections and orthotics are effective for some patients, others may require surgery in order to achieve effective symptom relief. Surgery for arthritis of the first metatarsal (big toe) may involve joint arthrodesis, which is a fusion of the bones in the joint to prevent them from rubbing against each other and causing pain. The bones are held together with metal screws and a plate to help them heal in place. Patients usually experience successful pain relief after this procedure and may have swelling in the toe for several months during the healing process. 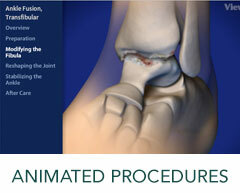 To learn more about our First MTP Joint Arthrodesis Services, please contact us today to schedule an appointment!